Photo by Pixabay on Pexels.com • Exotic birds such as the hornbill often employ ingenious nesting methods to ensure successful reproduction. I received a letter from Wayne and Dot Ballard sharing information about an ingenious but unexpected roosting location they provided for a wren at their home in Marion, North Carolina. Wayne found the an old bird’s nest attached to the limb of a cedar tree. Dot tied a piece of twine around the ends of the limb and let it hang from a hook under the eave of their porch. Wayne and Dot felt fortunate to enjoy this peek into the wren’s life. “We always enjoy God’s nature, especially when we are allowed to witness it so close,” Dot wrote. The couple did ask if I thought the nest had been built by wrens. I believe that, although a Carolina wren adopted the nest for its roost, another species of bird probably built the nest. The photos the Ballards enclosed with their letter show a cup-shaped nest of the sort that might have been built by a sparrow or warbler. Their letter persuaded me to explore some of the unusual ways some of our feathered friends go about creating a nest, or home, for their young. The ingenuity of some birds in building a nest is quite remarkable. The majority of our common backyard birds build the familiar “cup-shaped” nest that is tucked away in a shrub or the fork of a tree. Birds that build nests in such a fashion include everything from blue-grey gnatcatchers and scarlet tanagers to indigo buntings and American goldfinches. Other birds, such as Eastern bluebirds and tree swallows, accept human-provided nesting boxes. In the past, these birds relied on natural cavities, such as a rotten knothole in a tree’s trunk or a weathered fence post that had gone hollow. Many cavity-nesting birds do not or cannot excavate their own cavities. Some birds are better equipped to excavate their own cavities or burrows in everything from tree trunks to river banks. Cavity-nesting offers an added degree of protection in comparison with an exposed and vulnerable cup nest tucked in a hedge or dense shrub. Some birds, however, have taken cavity-nesting practices to the extreme. For instance, the female great hornbill builds her nest in the hollow centers of large tree trunks, and the opening is sealed with a plaster made up mainly of mud, droppings and fruit pulp. She remains imprisoned in her nest until the chicks are semi- developed, relying on the male to bring her food. During this period the female undergoes a complete molt. The young squabs are devoid of feathers and appear very plump. She is fed by her mate through a slit in the seal. The clutch consists of one or two eggs she incubates for 38-40 days. Once the female emerges out of the nest, it is sealed again by the chicks. In some species, the young depart with their mother, and are tended outside of the former nesting cavity by both parents. The great hornbill resides in the forests of India, the Malay Peninsula and Sumatra, Indonesia. There are about 55 species in the hornbill family, which ranges through Africa, Asia and some of the islands of Melanesia. Megapodes — also known as “incubator birds” or “mound-builders” — do not incubate their eggs with their body heat as other birds do, but bury them. Their eggs are unique in having a large yolk, making up 50-70 percent of the weight of the egg. They are best known for building massive nest-mounds of heat-producing, decaying vegetation, which the male attends, adding or removing litter to regulate the internal heat while the eggs hatch. This method of incubation is something practiced by some reptiles, including crocodiles and alligators, but it is definitely unusual among birds. Once hatched, young birds are fully feathered and active, already able to fly and live without any care or assistance from their parents. Wrens are known to nest and roost in some unusual places, as shown in this painting of wrens nesting in an old hat by artist John James Audubon. Two of the better-known species, both from Australia, are the malleefowl and the Australian brush-turkey. There are about 20 species of birds classified as Megapodes, and they are concentrated in the Australasian region, including islands in the western Pacific, Australia, New Guinea and the islands of Indonesia east of the Wallace Line. They also occur on the Andaman and Nicobar Islands in the Bay of Bengal. The white tern is a small seabird found across the tropical oceans of the world. Although other terns build nests, the White Tern no longer bothers to construct even a rudimentary nest. Instead, the female lays a single egg on bare branches or in a small fork in a tree. Nothing else is added to the location where the egg is deposited. The behavior is not typical of terns, which generally nest on the ground and construct the nest of such materials as shells or other debris. Of course, both the eggs and chicks of white terns are vulnerable to becoming dislodged by heavy winds. Newly-hatched chicks have well developed feet they use to hang on to their precarious nesting site. Photo by U.S. Fish & Wildlife Service • A white tern incubates a single egg but doesn’t build an actual nest. The sparrow-sized sociable weaver (Philetairus socius) of Africa enjoys company, which explains how and why such a small bird constructs a huge nest. Actually, many of these birds working together construct a huge structure — sometimes described as similar to a bale of hay — that hangs from sturdy trees and other tall structures. Such a “compound nest” is rather rare among birds. The communal nests built by sociable weavers can house 100 pairs of birds and are quite spectacular. They are also considered the largest bird-built structures in the world. Other birds also benefit from these huge structures, which are built mostly of grass and sticks. Other species of the Ploceidae, or weavers, also build communal nests, but their efforts are not quite as impressive as those constructed by the sociable weaver. Other small birds may also nest or roost in the structure, and large birds, such as vultures, have been known to build their own nests on top of these compound nests. In nature, nothing gets wasted. 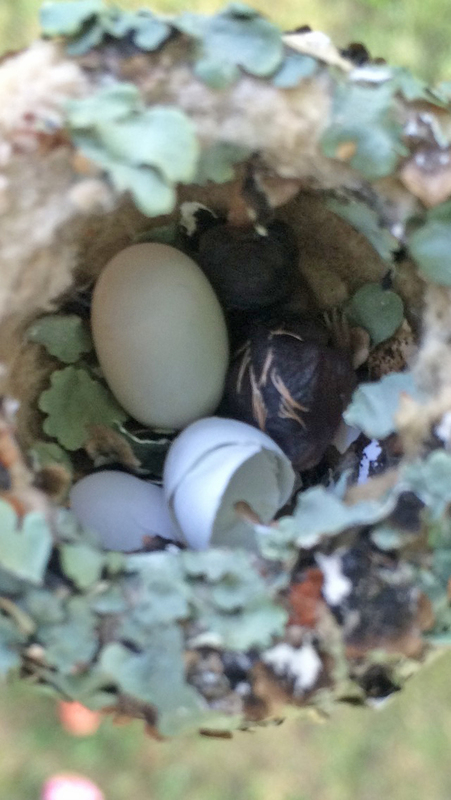 A Carolina wren using another bird’s used nest is not all that rare. These birds are fond of a cozy nook. If they can find one ready-made, it’s all the better. This entry was posted in Birding, Birds, Bristol Herald Courier, Bryan Stevens, Bryan Stevens Feathered Friends, Elizabethton Star, Erwin Record, Johnson City Press, Jonesborough Herald and Tribube, Kingsport Times, McDowell News, Nesting birds, Nesting hummingbirds, Uncategorized and tagged Blogs, Bristol Herald Courier, Elizabethton Star, Erwin Record, greeneville sun, Johnson City Press, Kingsport Times-News, McDowell News, nature, Nesting birds, Tennessee, Tennessee Ornithological Society, Virginia on July 22, 2018 by Bryan Stevens. 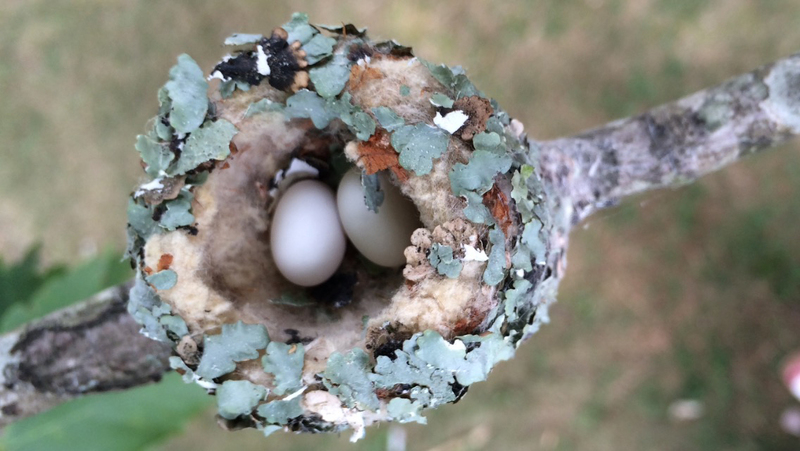 Photo Courtesy of Donna Ottinger This nest, filled with two tiny eggs, was discovered in a maple tree in a Bluff City yard by Donna Ottinger. For Bluff City, Tennessee, resident Donna Ottinger, the show in her front yard beats anything you might find on television this summer. Since late July, Donna has been watching a female ruby-throated hummingbird that she has named Bliss carry out her nesting duties. 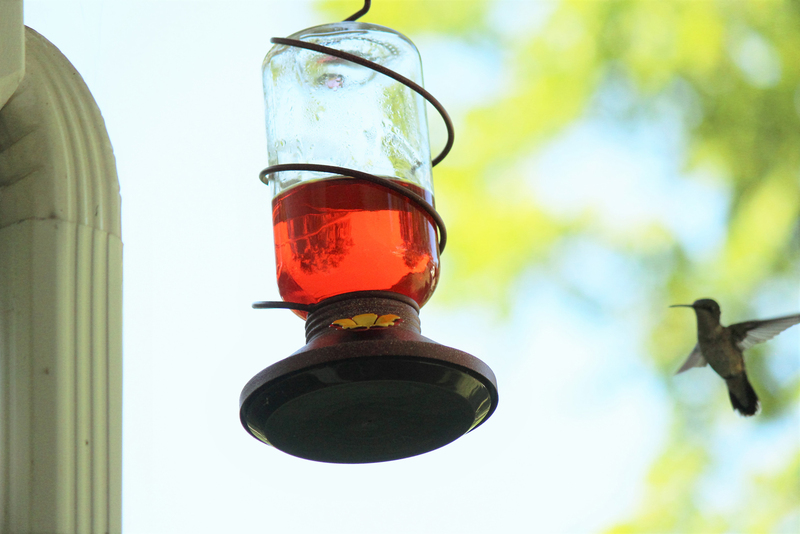 Photo Courtesy of Donna Ottinger Bliss the ruby-throated hummingbird visits a feeder for a sip of sugar water. 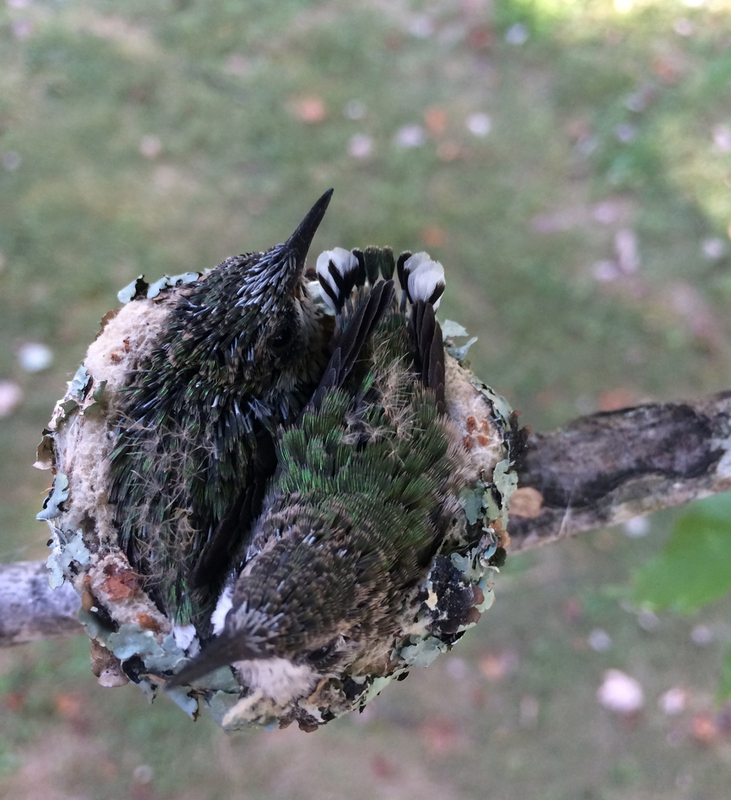 Like all female ruby-throated hummingbirds, Bliss produced two eggs for containment in a delicate nest of spiderweb, lichen and plant fibers woven onto a maple tree branch. There are some reasons why it’s always a pair of eggs for hummingbirds. First, the nest is so small — about the size of a walnut half-shell — that there is barely room for two eggs, let alone more. Second, once the young hatch, the nest has just enough room to accommodate them as they grow, fed well by their mother. Third, feeding two hungry young hummingbirds is a demanding task. 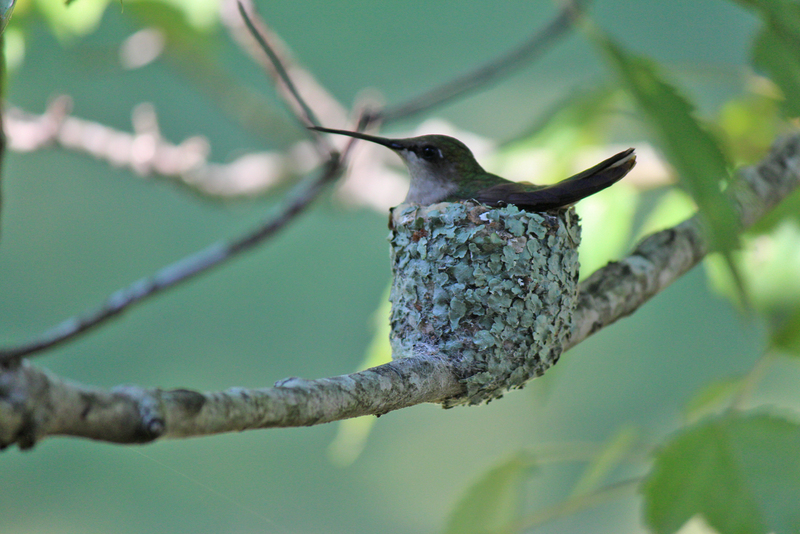 A female hummingbird has to find enough food to fuel her own body and help her young in the nest grow and thrive. It’s a full-time job during the daylight hours. She’s pressed hard to succeed at raising two young. Attempting to rear more would most likely prove impossible. Donna compared the two tiny eggs to Tic Tac mints. The entire process — from building the nest to incubating eggs to tending hatchlings — requires a commitment of more than two months. Donna noted that even after the young hummingbirds hatched, Bliss continued to reinforce the nest with collected silk from spider webs. Donna kept the nest under observation after she discovered it in late July. As she noted on her Facebook page, finding a hummingbird nest is not an everyday occurrence. The nest is on one of the lower branches of a large maple tree in her front yard only a short distance from her porch. She was able to sit comfortably while watching Bliss come and go to her tiny nest. 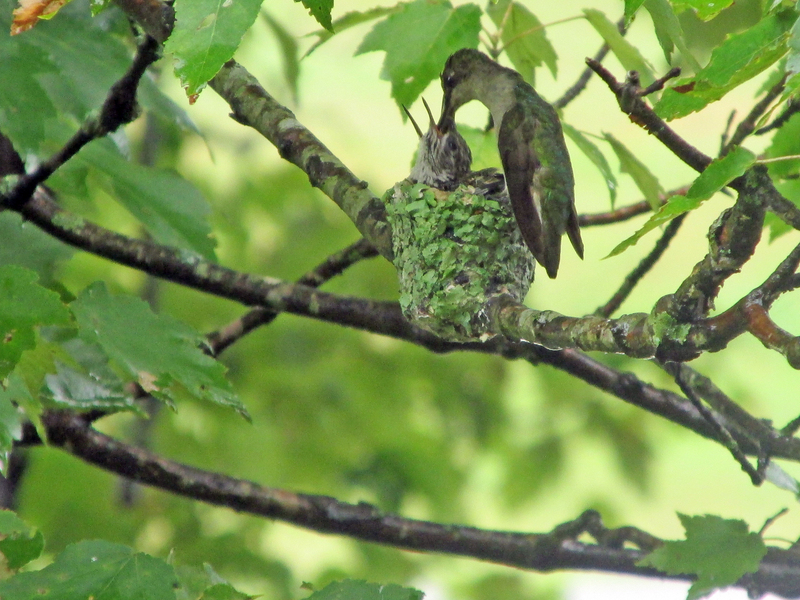 Photo Courtesy of Donna Ottinger Bliss, a ruby-throated hummingbird, sits on her nest to incubate her two eggs. “It’s been a real blessing,” Donna told me when we met in person on Aug. 19. She was gracious enough to permit my mom and me to sit on her front porch and enjoy the show. During our visit, we got to watch as Bliss arrived to feed the babies. It’s not a spectacle for the squeamish. Bliss plunged her long bill deep into the throats of each baby bird in turn and pumped some nutritious contents into the growing youngsters. Despite the fact that it looked like she could easily impale the babies, they suffered no ill effects and looked quite full and satisfied after the visit. Photo Courtesy of Donna Ottinger On Aug. 1, one chick hatched. The second chick hatched the following day, making for a very full nest. The two babies were hatched on Aug. 1 and Aug. 2, respectively. The staggered hatching reflects the fact that Bliss also laid the eggs on separate days. Not knowing the gender of the babies, Donna named the Aug. 1 hatchling Monday for the day of the week hatching took place. In turn, the second baby, which escaped its shell on Aug. 2, was named Tuesday. Once hatched, young hummingbirds remain in the nest about 28 days (nearly a month) and depend on their mother to bring them regular meals. If that’s not enough, the ruby-throated hummingbird is known to nest twice in a season. It certainly must rank a female hummingbird as one of the busiest of our summer birds. At the time I wrote this column, Monday and Tuesday had still not left the nest. The young hummers have grown at an astonishing rate and Donna has witnessed their progress day by day. She noted that young hummers start off life with a short bill. Like the rest of their bodies, however, their bills have grown accordingly as Monday and Tuesday received regular feedings from Bliss. 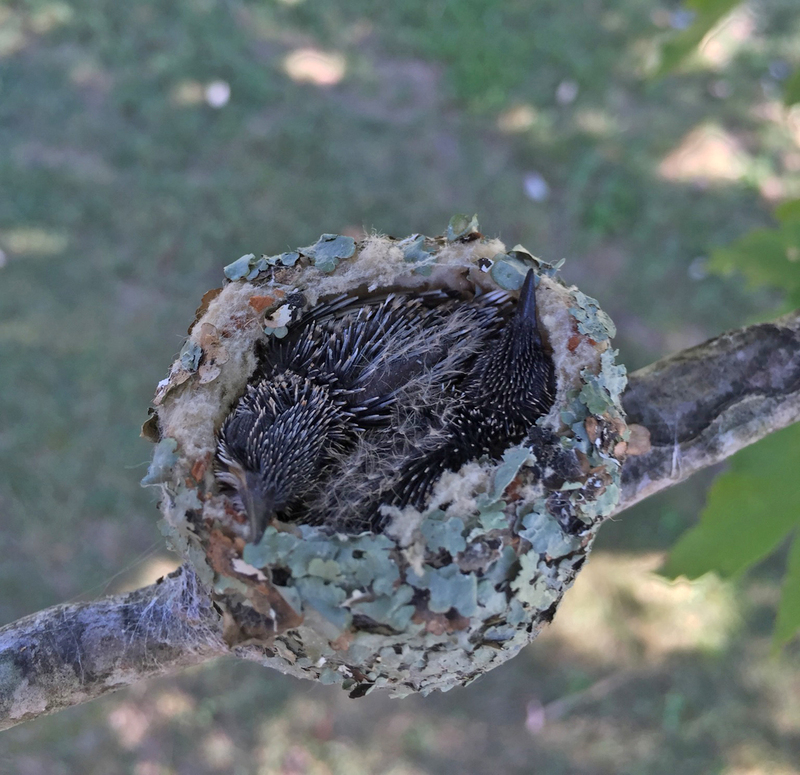 Photo Courtesy of Donna Ottinger Having grown at a rapid pace, hummingbird chicks Monday and Tuesday find their nest growing rather cramped by mid-August. Female hummingbirds receive no assistance from their mates. Males don’t assist with the rearing of their own young. For male hummingbirds, summer is mainly a time to thrive on the abundance of nectar-bearing blooms, as well as a profusion of tiny insects and spiders that also make up a good portion of their diet. When I saw them, I knew that little Monday and Tuesday would be out of the nest in a short time. It would also be necessary for them to soon begin fall migration. 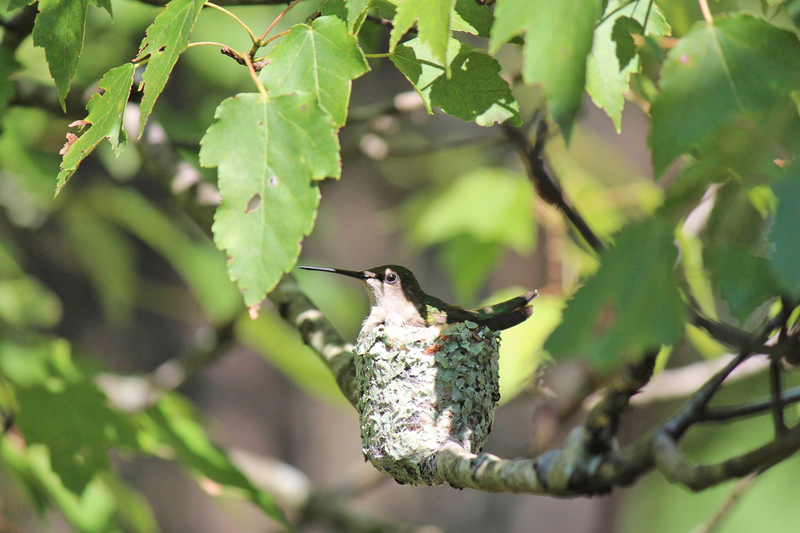 On Aug. 23, Donna reported on her Facebook page that the young hummers had left the nest. Photo by Bryan Stevens Bliss feeds her two young hummingbirds. The next generation of hummingbirds always helps swell the number of these tiny birds in our yards in late summer and early fall. Keeping visiting ruby-throated hummingbirds can be as simple as planting an abundance of the flowers they love, but offering multiple sugar water feeders also helps. Keep the sugar water mix at a four parts water to one part sugar ratio. Don’t offer honey in your feeders. When mixed with water, it can spoil and spread fungal diseases. Remember that hummingbirds don’t subsist on sugar water alone. They also eat numerous tiny insects and spiders to obtain the protein they need for their dietary needs, so don’t use insecticides near feeders or flowers that hummers are likely to visit. Photo Courtesy of Donna Ottinger Monday and Tuesday find the nest increasingly crowded in the days before they fledged. It was absolutely wondrous to observe Bliss and her babies. The experience has motivated me to keep a closer watch on the hummingbirds in my yard. There are female hummers present every summer. They have to be nesting somewhere, and I’d like to find a nest in my own yard. Photos Courtesy of Donna Ottinger Monday and Tuesday share a compact nest. Bliss incubates her eggs at her nest in Bluff City, Tennessee. This entry was posted in Birding, Birds, Bryan Stevens Feathered Friends, Hummer/Bird Study Group, Hummingbirds, Nesting hummingbirds, Ruby-throated Hummingbird, Uncategorized, Young birds on September 11, 2016 by Bryan Stevens.